Maybe Alpinoid (Borreby?) with Med? His eye/brow region remind me of Rudolf Hess. Maybe Alpinoid (Borreby?) with Med? His shallow mandible and narrow nasal root do indicate a Mediterranean. I'm wondering if there might be some Faelid in there as well--specifically I'm seeing the overhanging brow, deepish eyes and what appears to be a broad, or relatively so, bigonial diameter. Obviously his pigmentation is Mediterranean. When I think of the Balkan I think mainly of dinarics, ofcourse there are other types in the Balkan too but dinarics are the most common I believe. 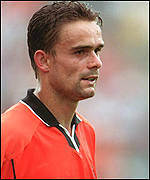 I dont think Marc Overmars looks dinaric. My opinion would be that he is Mediterrenean. I noticed the bigonial being greater than a Mediterranid. Maybe there is some Phalian, in weak form. Phalian is quite common in the Netherlands. The Dutch have also mixed greatly with Europeans and non-Europeans. A name does not indicate much, sometimes nothing at all, like with Negroids who got Anglo-Saxon names . In any case I think it can be explained by Dinarid. His vault look quite high. Don't you think? See the attached pictures of three Dinarids. Did I say he was Dinarid? Maybe Dinaroid Even pure Dinarid types are hard to come by.Anyway, Borreby-like types are usually the root race of Dinarids I believe.Look at his wide,high forehead,bi-gonials,zygs etc...He looks Borreby/Med(more pigmentation wise).It's common in the Balkans,especially with Montenegrins/Serbs. Last edited by Vojvoda; Friday, June 4th, 2004 at 11:37 PM. The Dutch have also mixed greatly with Europeans and non-Europeans. Modern day dutch people are a mixture between Celtic, Germanic, Roman, Spaniards who ruled Holland for a long time, French who ruled Holland, Southern-French Hugenots who immigrated to Holland and many others. Its a big mix and thats why dutch people can look like anything, some dutch people look like blackhaired darkbrown eyed Sicilians other dutch people are blond and blue eyed etc. There is only one thing that all dutch people have in common : white skin.